We are currently running 7 to 10 days for manufacturing. From Time to Time we can have shortages in different species. we will contact you if there are any issues with supply. Measure the opening in your floor, wall or ceiling. The width and length of your opening should match the duct opening sizes. We offer custom sizes on our Egg Crate Style Vents, Call our toll free number for further assistance 1-866-216-1215. We currently only offer Clear Coat in Satin and Semi Gloss. We also offer the vents unfinished and ready for your own stain choice. 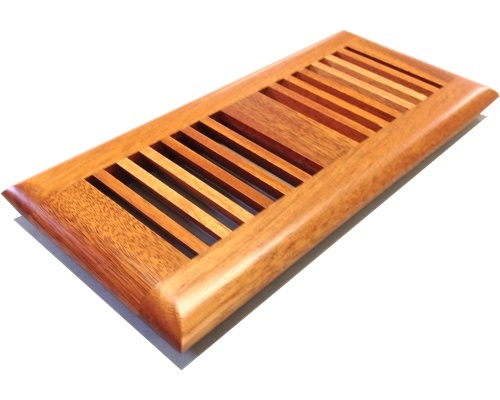 Our vents are manufactured in Red Oak, White Oak, 1/4 Sawn White Oak, Maple, Poplar, Ash, Hickory, Fir, Cherry, Walnut, White Pine, Sapele Mahogany, Brazilian Cherry, Brazilian Mahogany, and Brazilian Walnut. A flush-mount vent sits flush with 3/4" hardwood floor. It is recommended that this vent be installed with the hardwood floor. A cold-air return is a vent that is usually much larger than a standard heating vent. These are usually wall-mounted and are positioned in line with the baseboard. How do I finish an unfinished register? All of Vents are Hand sanded with 220 grit sandpaper so they are ready to take a finish. Stain and wipe all surfaces of the register. Allow to dry thoroughly then apply three coats of clear finish to all surfaces with a light sanding in between. All of our vents are made to order and unfortunatly are not returnable. Please call our toll free number 1-866-216-1215 and a representative will be pleased to help you.